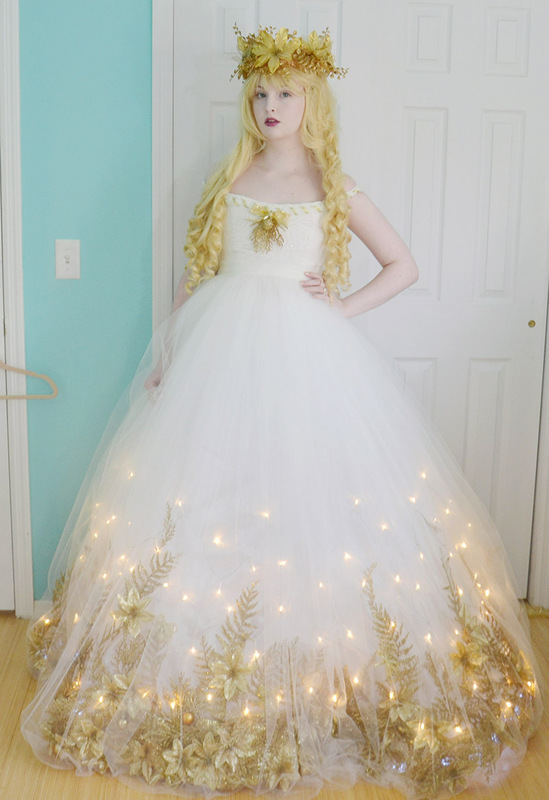 This is going to be a continuation to my last post, where I talked about making a glittery, light up, christmas skirt. Though this may be significantly less interesting because it doesn’t involve lights or glitter. Boo. 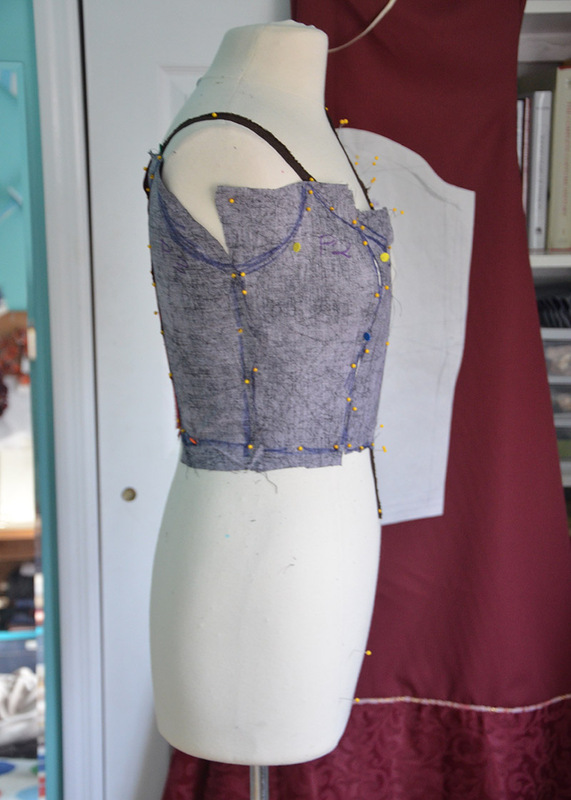 I wanted the bodice to be really simple. There is so much going on in the bottom of the dress and I wanted that to be the highlight, my plan for the bodice was something structured with an overlay of gathered tulle. 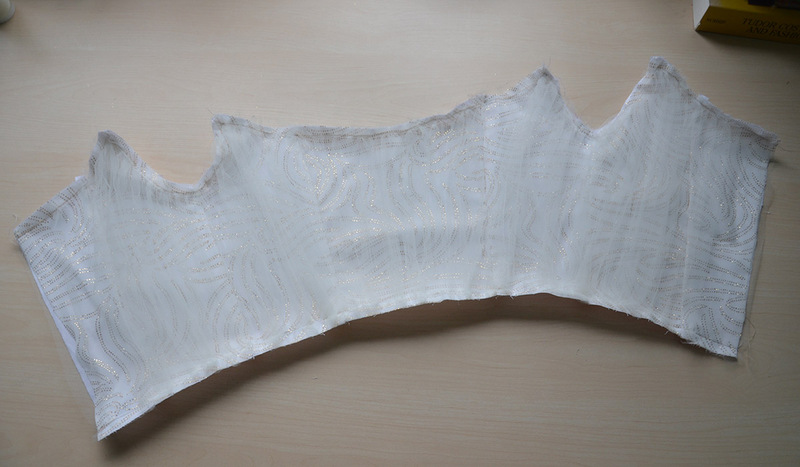 But it worked out just fine, and once removed from my dress form it looked like this. I ironed all the pieces, then turned it into a paper pattern. When the pattern was done I made a mock up. It looked pretty good, the only fault was that it was too large! 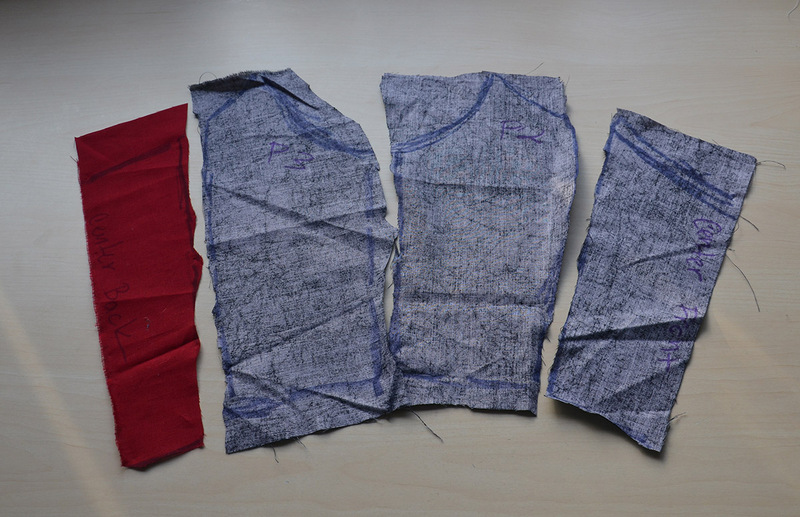 But that was an easy fix, and once I made it I was ready to move onto my real fabric. 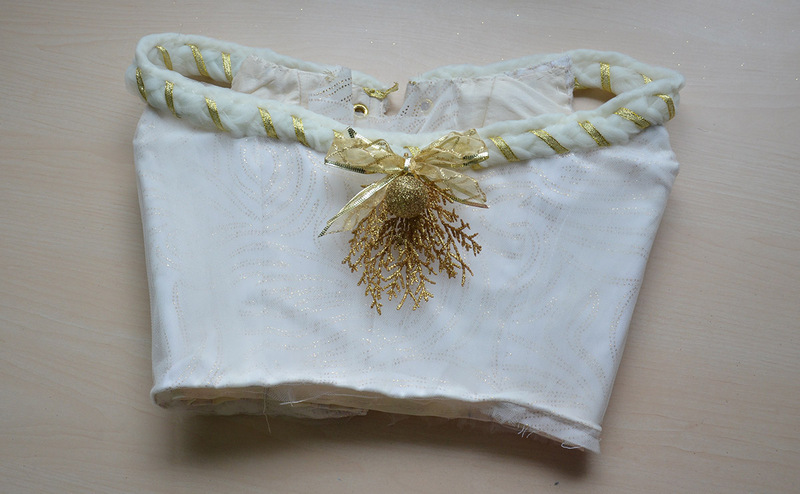 I decided to use ivory shantung for this, I had a good amount of it laying around from a past project, and it has the right weight for a bodice. 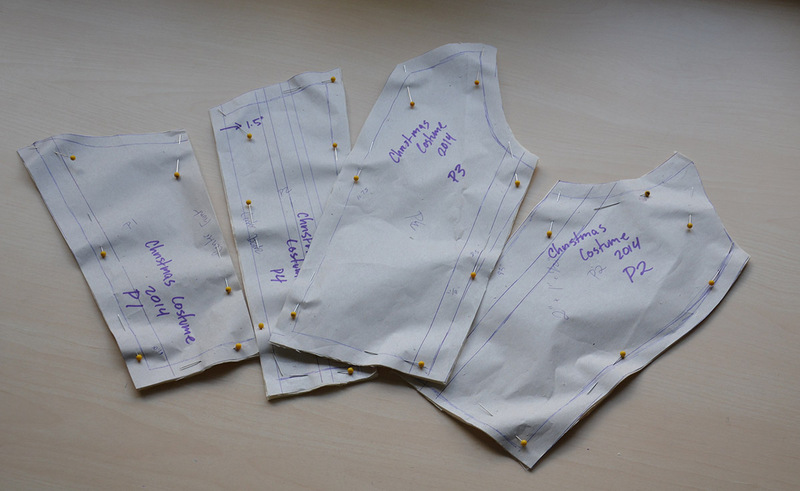 I cut my pattern out twice since I was using it for the top layer and for lining. Here is what the top layer looked like laid out. 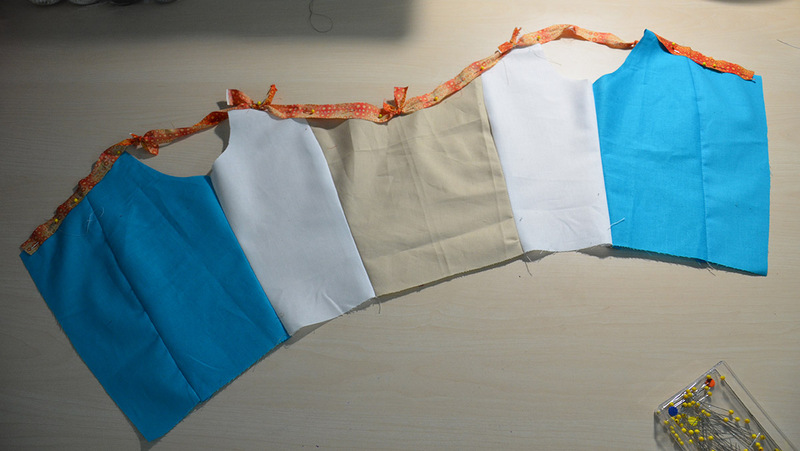 They all got sewn together and in just a few minutes I had a functional bodice! As lovely as that was, my priority was making the lining, so I set that aside. 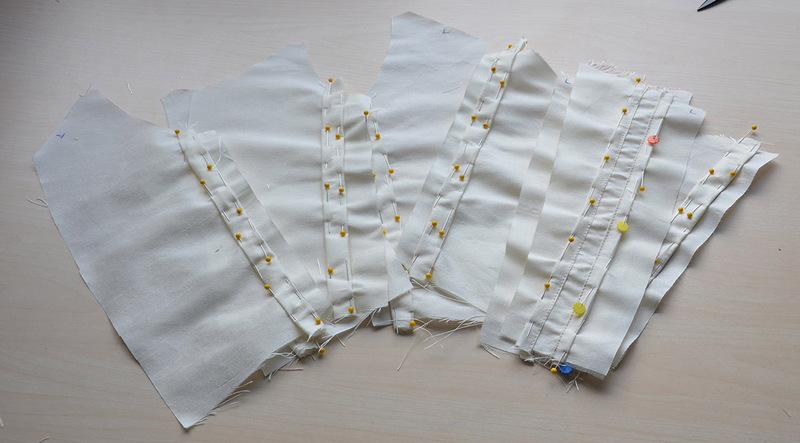 For the lining I marked boning channels out on each piece, then I cut strips of shantung, turned the edges inward, and pinned them between the lines. Then they all got stitched down. The pieces got assembled, then the channels were filled. I used a mixture of hooping wire and plastic boning, not because it’s the best, but because i’m lazy and neither of those have to be filed/tipped. After the boning I turned all the edges over a half inch. Now I went back to the top layer! It was time to add the tulle overlay. 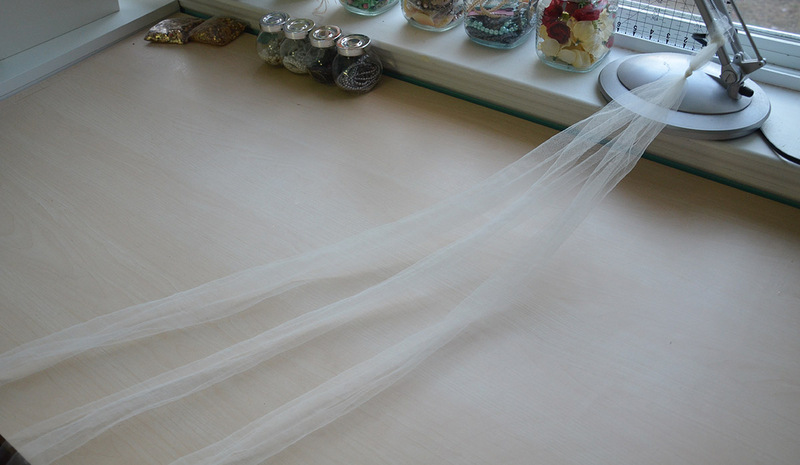 To make this I sewed together three pieces of sixty inch wide tulle. 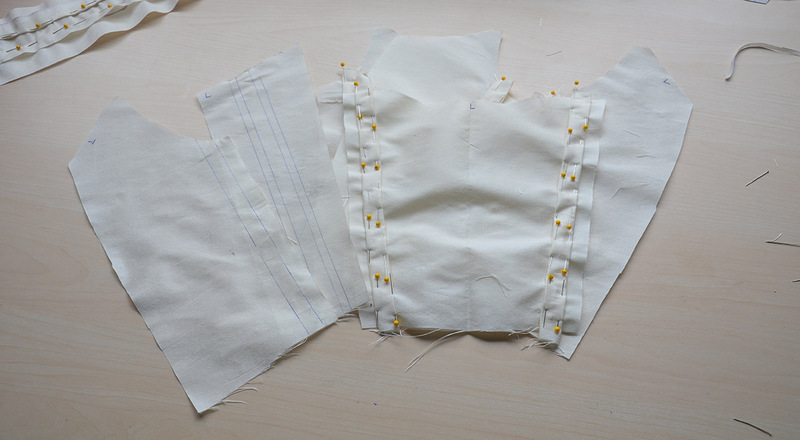 I gathered the top edge down by hand, then stitched it to the bodice. After that the edge was turned over and sewn down. 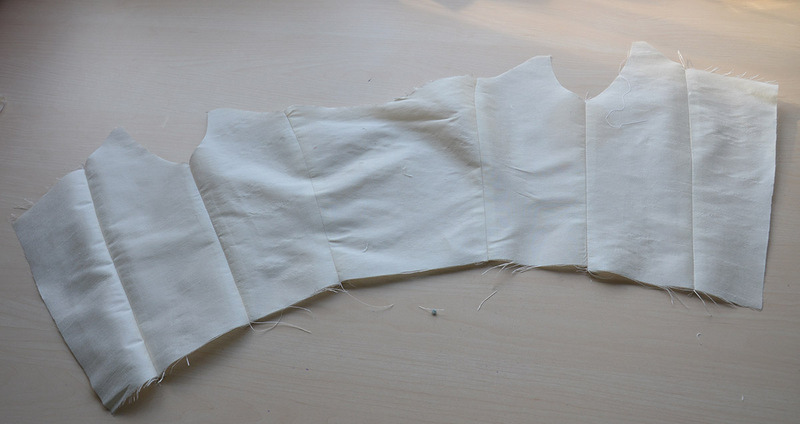 I also sewed the top edge to the lining. The bottom edge got gathered as well, then sewed down. I tried it on and there was a little issue. It definitely looked christmasy, but only because it gave me the shape of a snowman! 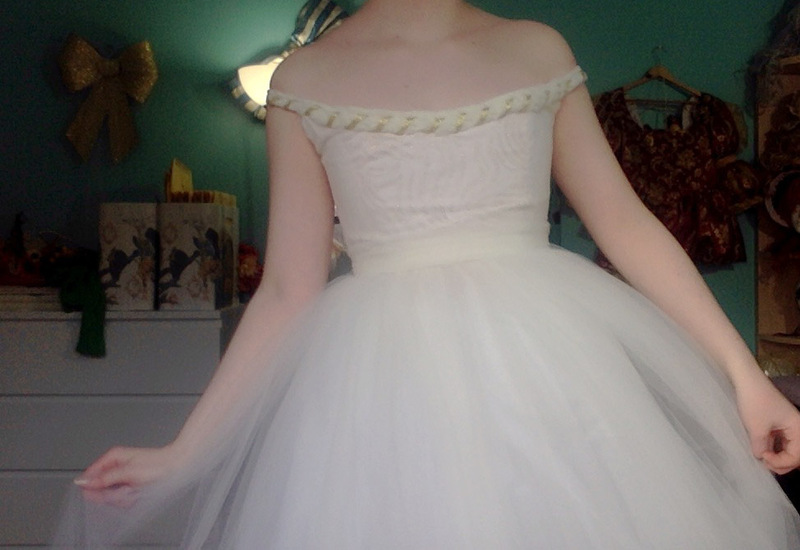 The tulle puffed out and desperately needed to be tacked down or something. But before I got to tacking it down, I ran into another little issue. 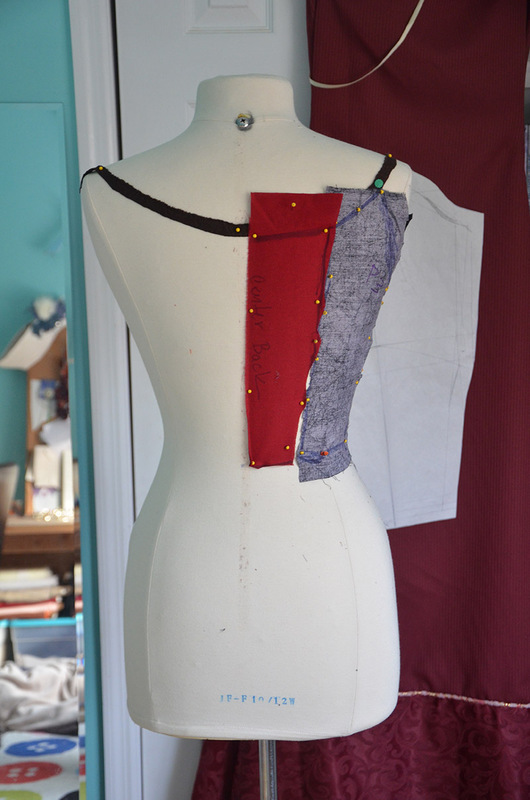 I placed the bodice on the dress form, along side the skirt, and realized something – they didn’t match. Now in my defense I made the bodice before the skirt, and in my head I was thinking “The skirt will be made from ivory fabrics, so the bodice should be too!” which makes sense. 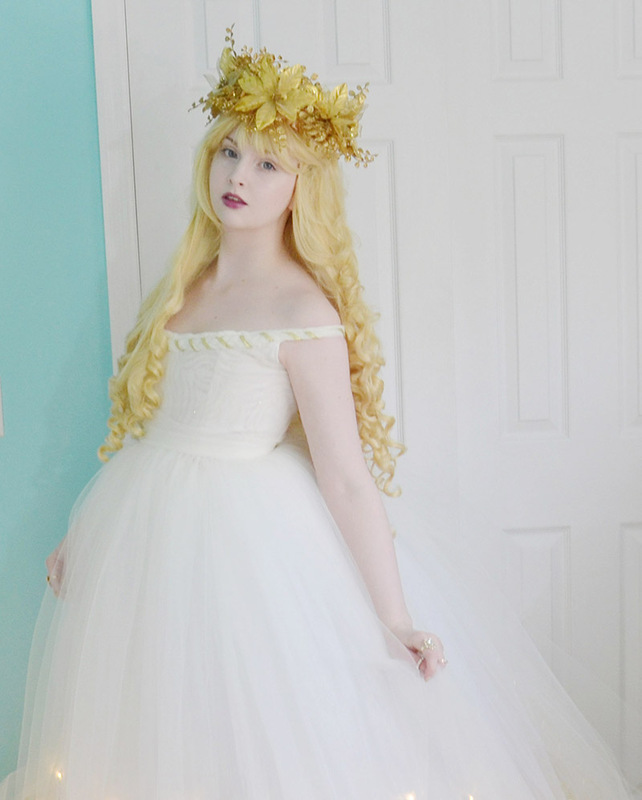 But the skirt is actually made from ivory organza with an overly of ivory tulle – both fabrics are sheer, so the main color that shines through is the white from the petticoat worn underneath it. Because of that the skirt is a really strange shade. 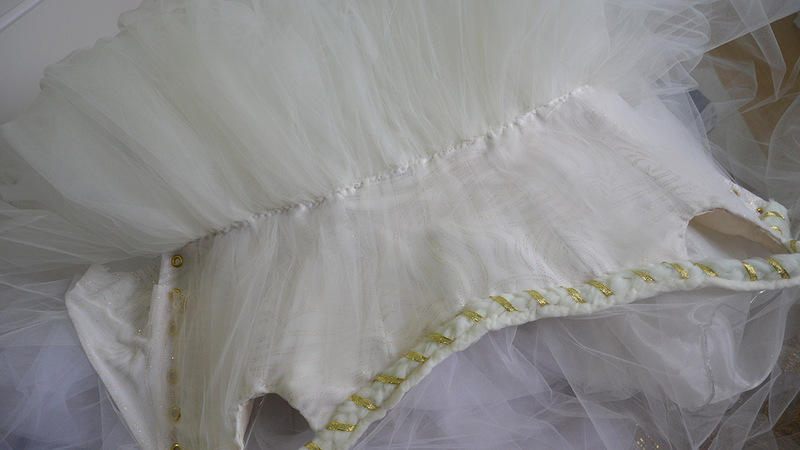 It doesn’t help that the ivory tulle is especially yellow colored, and the white tulle (used for the petticoat) is very cool toned. The end result is a very light, warm white almost greenish toned shade. It definitely didn’t match any of the ivory fabrics I owned. I did find a few potential options in my stash. The fabric on the left is a sheer mesh that also has a strange not white but not ivory tone to it, so I chose to use that. Unfortunately my fabric struggles weren’t over yet, since the material is sheer I had to find something to go under it. Using white made it look too light, and ivory was too dark and red toned. So I once again had no clue what to do. I ended up tea staining some white cotton sateen. I filled a plastic shopping bag with steaming water, stuck two bags of tea in it for five minutes, removed them, then added the fabric. The fabric only stayed in for sixty seconds, then I removed it as well. 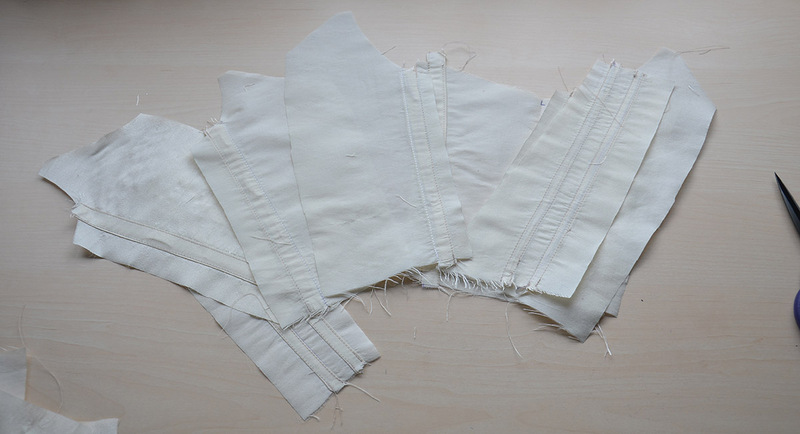 It’s in the middle – the undyed cotton sateen is on left, the shantung on right. 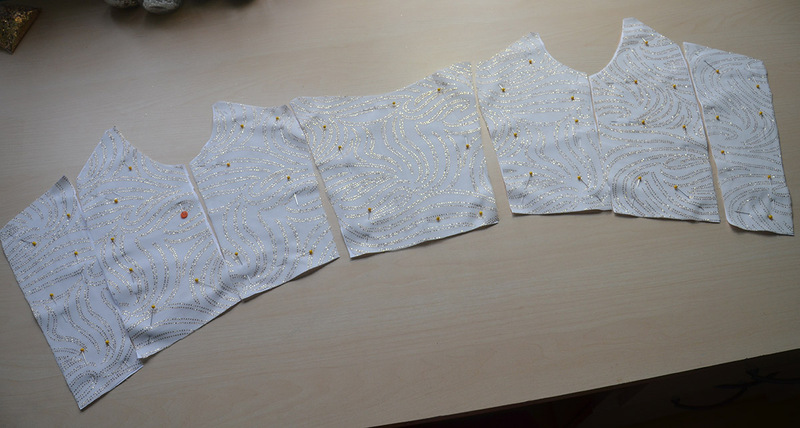 Soo I made the bodice, again. I sewed on the tulle by machine this time, because my patience wasn’t as big the second time around! Luckily I did manage to fix the snowman effect this time. 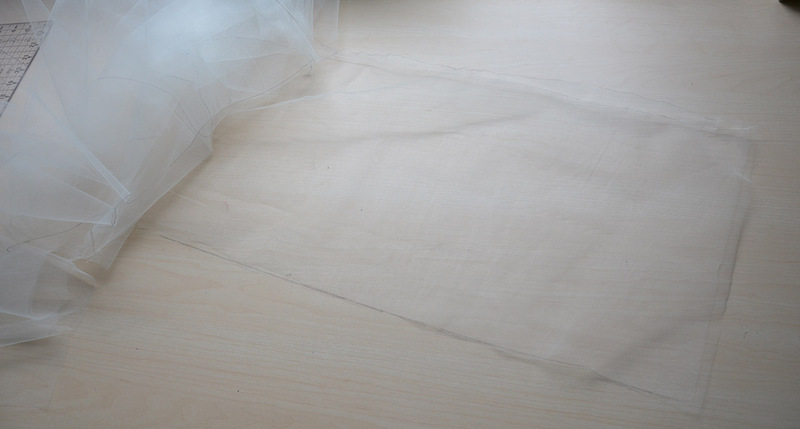 After the bodice was assembled I laid it flat on a piece of tulle and cut the tulle to be the exact same size. I stitched this on after the gathered layer to keep it flat! I added grommets! They are each one and a half inches apart, except for the center ones, they are two inches apart. Which looks a bit silly but doesn’t effect how the garment wears. Now it was time for decorating it! 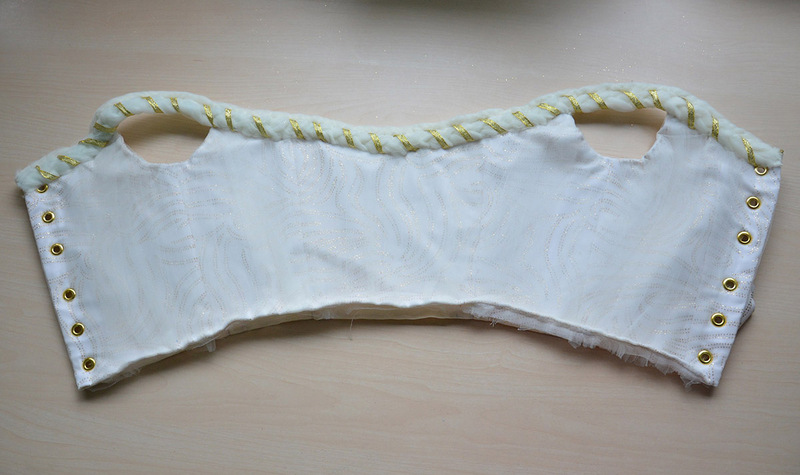 The first thing I did was make the braided trim for the neckline. This was really easy to create, I cut three strips of tulle and attached them to a solid base. I braided them together and tied on both ends. I tried it on with the bodice and I honestly hated how it looked. My plan for a simple bodice didn’t really work because it didn’t compliment the skirt, it just looked really bland by comparison. To fix it I made another tulle braid, this time much larger. And when it was done I wrapped it in gold ribbon. I stitched this to the smaller braid and attached them to the neckline. I was much happier with how this looked! 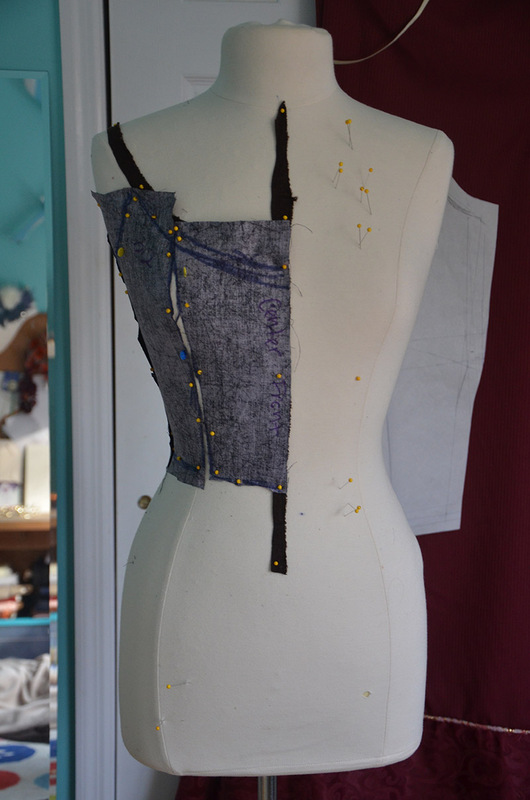 I also added a glittery mesh modesty panel to hide any back fat. Which is the not so glamorous side effect of wearing a boned bodice. It’s just a rectangle with a snap on one corner, which joins up to another snap on the opposite side. I still felt like it might be missing something, so I glued together a few glittery bits and a gold bow. 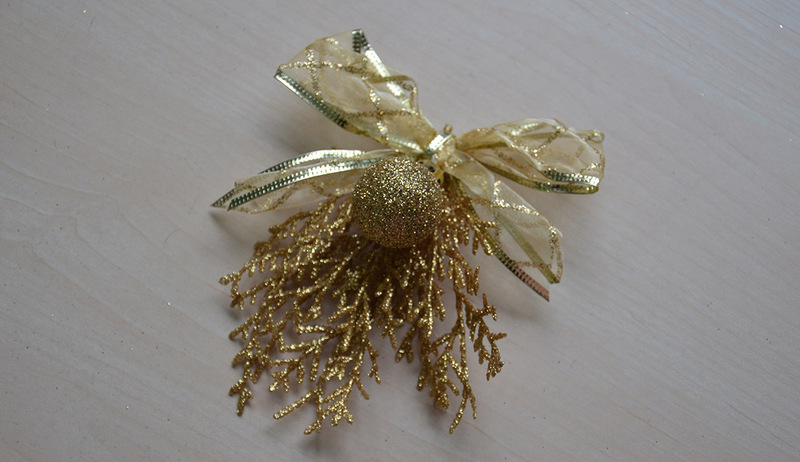 I also sewed on a glittery ornament. All of these items were also used in the skirt, so it makes it a bit more cohesive. However when it’s used it destroys my original, simplistic design. So I made it detachable and i’m not sure if i’ll end up using it or not. When the bodice was done I sewed it onto the skirt.. There was an ugly seam, which I honestly didn’t try very hard to avoid. I knew I would be using a sash of some sort so it didn’t bother me. 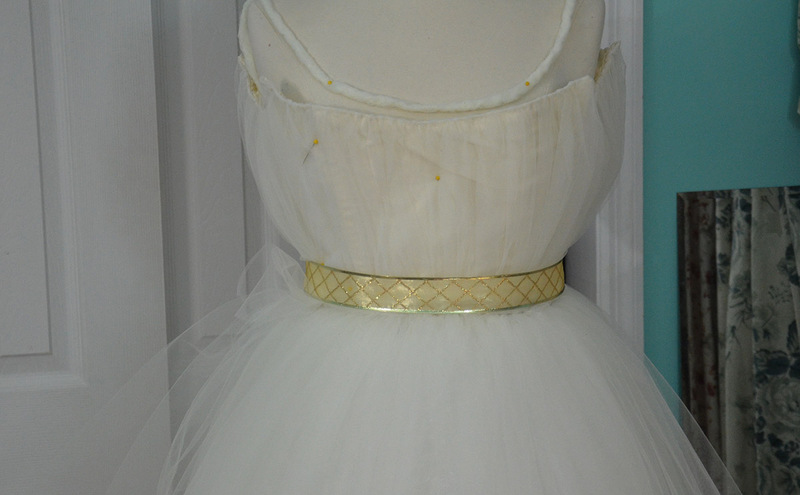 I ended up using several pieces of tulle to create a permanent (sewn down) sash. This is what the dress looked like during the first try on! So that’s the dress. I also wanted to pair it with a crown and wig. 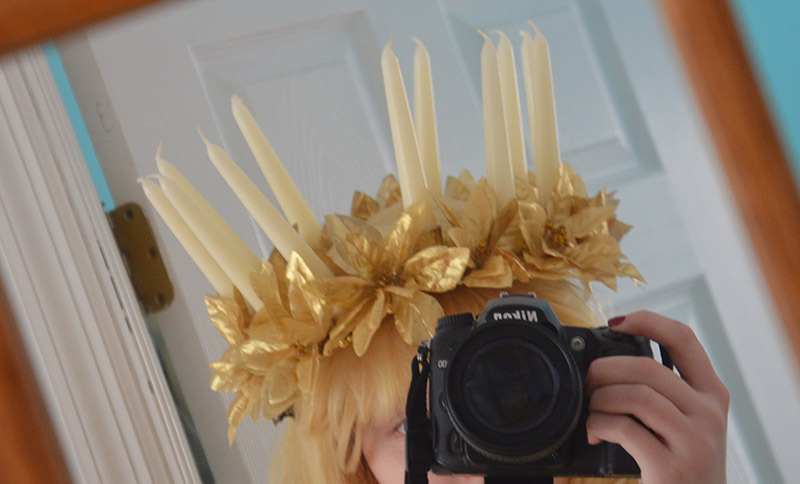 The crown was supposed to be a flower crown of sorts with candles extending upward. I know they make ones specifically for Saint Lucia’s Day, but they were bulkier than I wanted. And the few I found online were out of my price range, didn’t come in the color I wanted, and didn’t hold as many candles as I had hoped. I attempted to make my own from two strips of buckram and boning, it was structurally strong but forced the candles to lean inward. The second one had a reinforced cardboard base with holders made from cardboard tubes. It worked in theory but once I got it on my head it had a similar problem to the first, but this time the candles leaned outward! Once I put more thought into it I realized the idea wasn’t meant to be. Even if I could get it to work, I wanted photos of this costume outdoors and the wind would likely blow out the candles. I also wanted photos on a private tree lot, and I doubt they would like me setting things on fire. So I decided to trash this idea and just use my crown from last year. 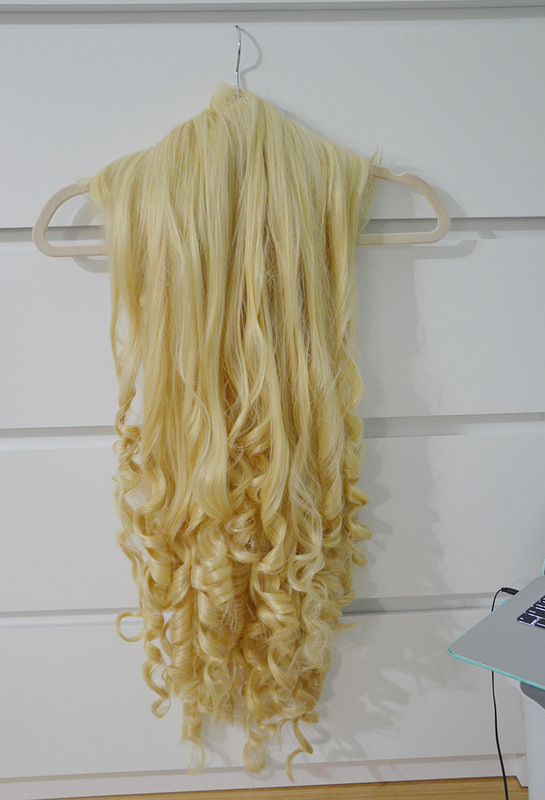 I also curled a wig. 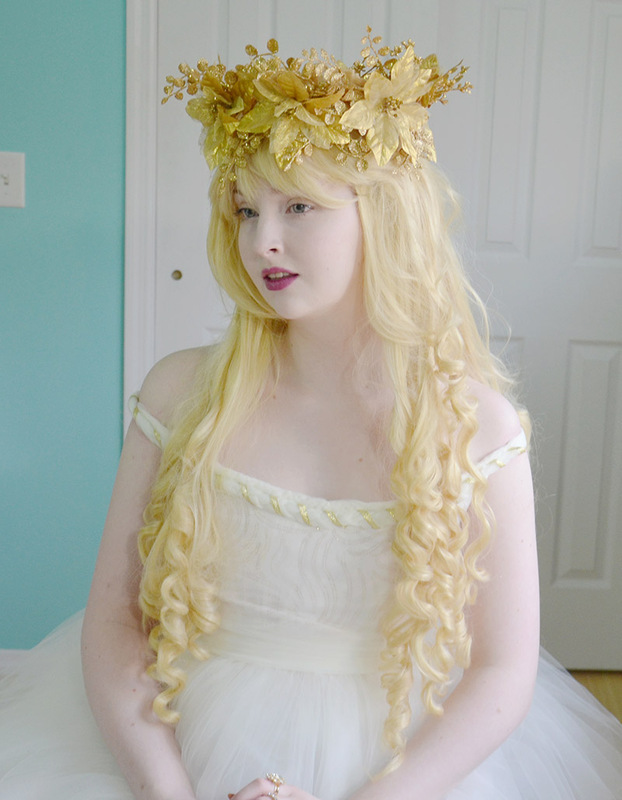 This wig is two super cheap ones that I sewed together. The wig had seen much better days and was a horrible tangled mess, it took two hours to detangle and another hour to curl. I talk about the curling process here! The final thing was finding accessories. 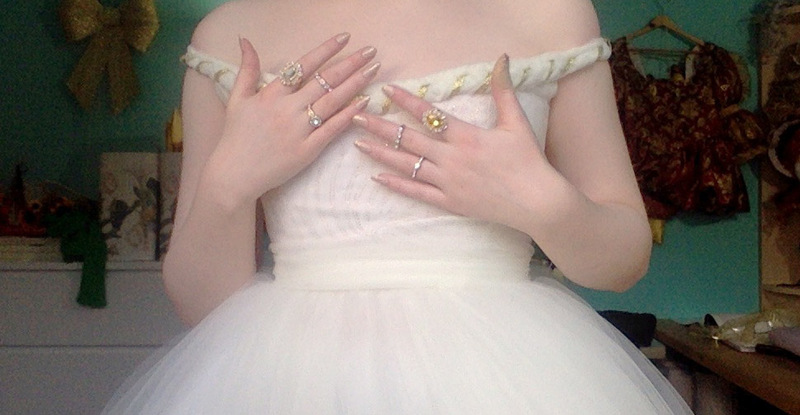 I settled on a tons of rings, the gold bands are from forever 21 and the rhinestone ones are from ebay, I got a big set for 80c a piece or something crazy! I proceeded to take some crappy photos in my room. I’m going to try and get photos at a christmas tree lot today, which should be better. I really want to photograph this in the snow, but we don’t usually get much until january or february. So the christmas tree lot is likely my only hope of seasonal photos! Someone suggested I add ribbon in the back, so I did that! This is wire ribbon I curled around a pen. So that is it for making this costume! 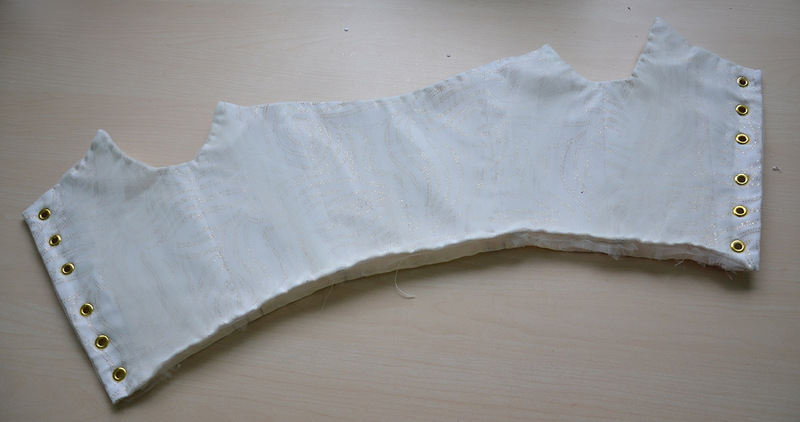 I did make a video that shows the process of making this bodice, if you are interested it can be watched here! Another amazing outfit! You are so creative and skilled! Congratulations! You look stunning! should i just make them anyways? Thank you! 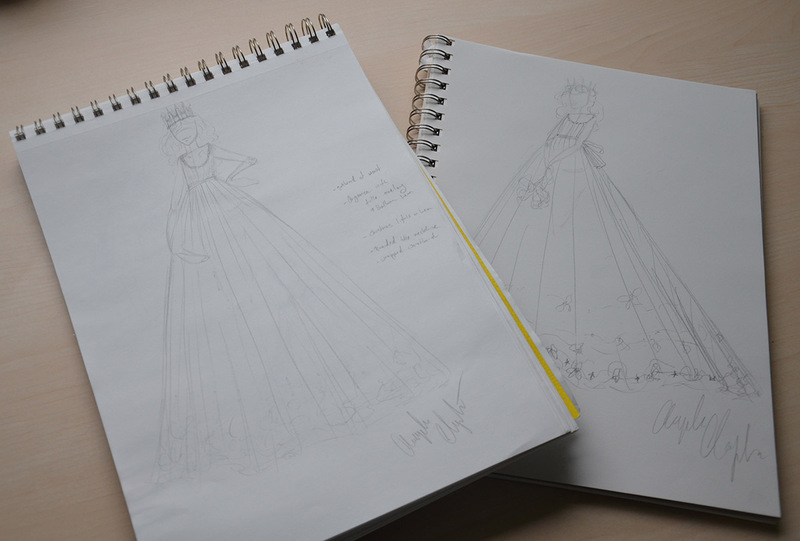 Well I certainly don’t have events that require dresses like this one…ever, and I make them anyway. If you enjoy the process of something I think it makes doing it worth it, even if the end result isn’t very practical! Hmmm then maybe I should just make them anyways lol I really enjoyed the process of making my Halloween costume and I’ve enjoyed making other formal kinda dresses so I think maybe I should sprinkle those in with some regular stuff too! Thanks for answering! Another wonderful dress! I wonder what you do with all the lovely things you make. Do you keep them all? Wow ! Thanx for sharing your beautiful creations Awesome ! You look just like an angel on the tree! Have you considered LED candles instead of real ones? It depends on the dress. This one shouldn’t have been restricting at all because the straps are quite flimsy, but I made them a little bit too short by accident which limits mobility. I can move quite easily in my off the shoulder 1800s gowns, because they are very flexible and made from cotton. 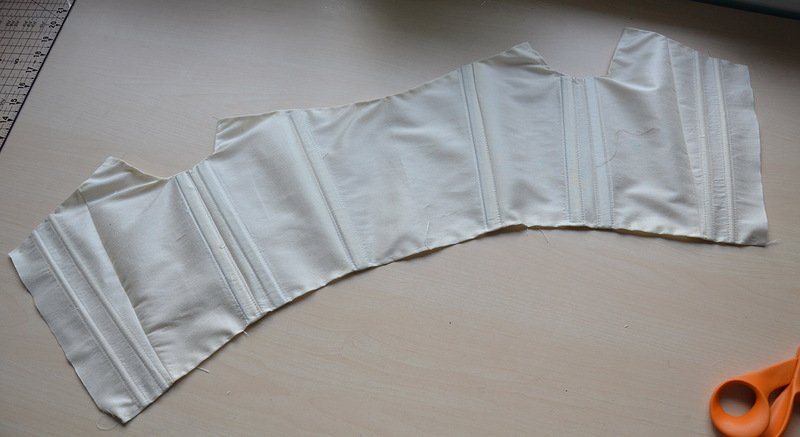 But if boning or stiffening is put in the neckline AND it’s tight fitting, you won’t be able to move your arms haha. The only dresses it’s been a major problem with was my big ivory “Dewdrop dress” and my Isabel Requesens renaissance dress. This. Is. Amazing! Would you consider making this into a wedding dress with green garland? 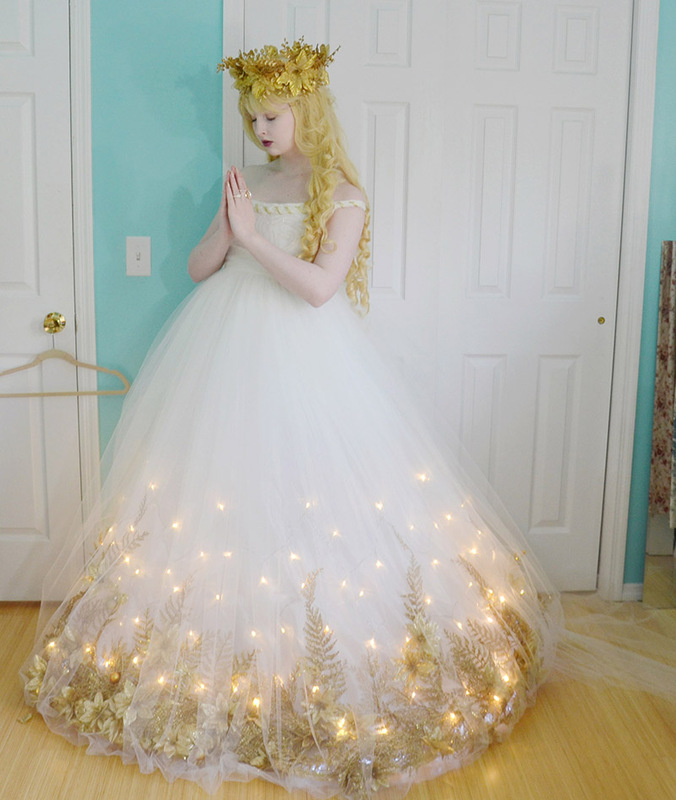 It would be perfect for my wedding! That is really beautiful! I love the way it looks all together. It’s really very beautiful! Even if you did have problems with the bodice, I think it ended up as a glowing ensemble, if you pardon the pun. This is gorgeous! You have mad skills! Love it! When I’m older, I might as well do it also! I LOVE this – so so pretty!! I don’t have any sewing skills but am going to try to make the skirt. Did you have a tutorial on how to make the skirt? 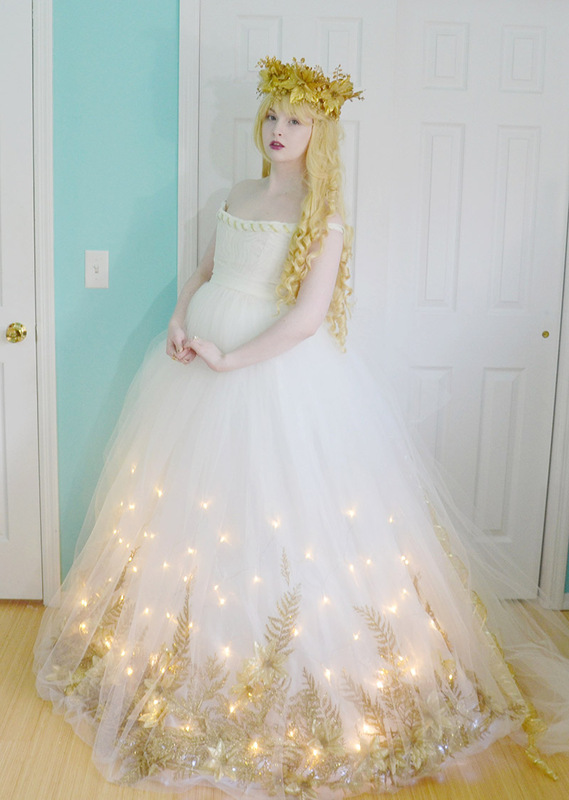 Wondering if you sewed LED lights into the tulle? BEAUTIFUL!!! Going to replicate as best as possible ( I cant sew) for a Christmas beauty pageant for my daughter.